Last month I was invited by Snack Out Loud to participate in a recipe showdown with two other Colorado based food bloggers. Snack Out Loud would provide their Crunchy Bean Snacks and I would "reinvent" a recipe using one of their five flavours. Never one to pass up a good challenge, I said "Bring it on!" A day later a huge box landed on my doorstep. Inside were several boxes of Snack Out Loud's Crunchy Bean Snacks. The kids wanted to dig right in, but I needed to do a little research. So we lined the five different flavours up on the dining room table and I started reading down the list of virtues on each package. I was getting excited already, but I still hadn't tasted them. So we ditched our typical afternoon snack (bread and fruit) and dove into the boxes on the table. I went for Ranch first. The beans were light, airy and crunchy and I was pleasantly surprised to find that they were slightly spicy! This isn't your run of the mill potato chip ranch flavour! It had a kick to it! I closed my eyes and recipes flooded my mind. These would be perfect sprinkled over a salad . . . like croutons . . . but perhaps that was a little too simple. Next I grabbed a bag of Jalapeno Cheddar. Whoa! My tongue was on fire! Immediately I thought of breading a chicken cutlet with these, serving it along side a spicy mango black bean salad with a cool margarita to wash it all down. I got out a notebook and began jotting down recipe ideas. Eve, meanwhile, was very happily munching away on a package of Tomato Basil bean snacks. I took a few and thought of pesto. Could I replace the pine nuts in traditional pesto with these? A nut-free pesto served over pasta! I wrote it down in my notebook. Connor grabbed a bag of Smokey Chipotle BBQ. A few seconds later he was panting and fanning his mouth with his hand! These were a little sweet and a lot spicy! I finished off his bag and got him a big glass of milk. They reminded me of a sweet, smokey chili. Something we'd eat on the camping trips of my childhood. The kind of chili you sop up with hearty cornbread muffins . . . I scribbled "bake into cornbread" in my notebook. Alas, it was getting late and we were all quite full (7 g of protein, remember) but there was still one flavor that no one had tried. Lightly Salted. I picked up a bag and popped a few in my mouth. Crunchy. Salty. Mild. Then it hit me: This was the perfect "blank canvas" on which to create a work of art. Something unusual, out of the box. Something decadent and sweet and unexpected. The recipes poured in faster than I could write them all down. In the end, when I finished the package, one word was written on the bottom on the notebook page: "Caramel." And so, after a few days of playing in the kitchen with melted sugar, chocolate, ice cream and even a little spiced rum, the recipe was finally born. 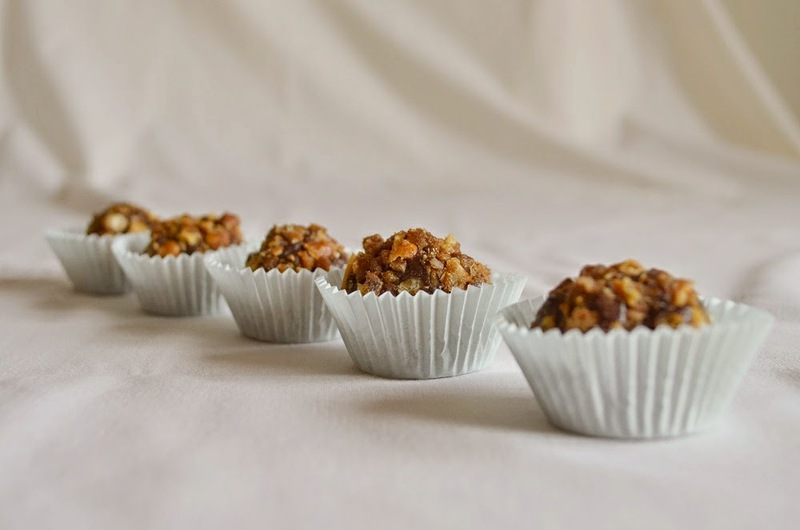 I was inspired by the crunchy texture to create a candy that was deep, rich and salty. I tossed the beans in a little homemade caramel and sprinkled them with cinnamon and sea salt. They were amazing just like this - like caramel corn (I even sprinkled a few on my ice cream that evening). I was tempted to eat the whole batch but held out. I had bigger plans for these crunchy little caramel beans. I made an easy chocolate ganache which I formed into little balls around the caramel beans. I put the remaining beans in a plastic bag, handed Connor a meat mallet and let him go to town. When the beans were crushed, we rolled the truffles in them, pressing all that caramel-y, salty goodness into the sides of the candy. Et voilà! 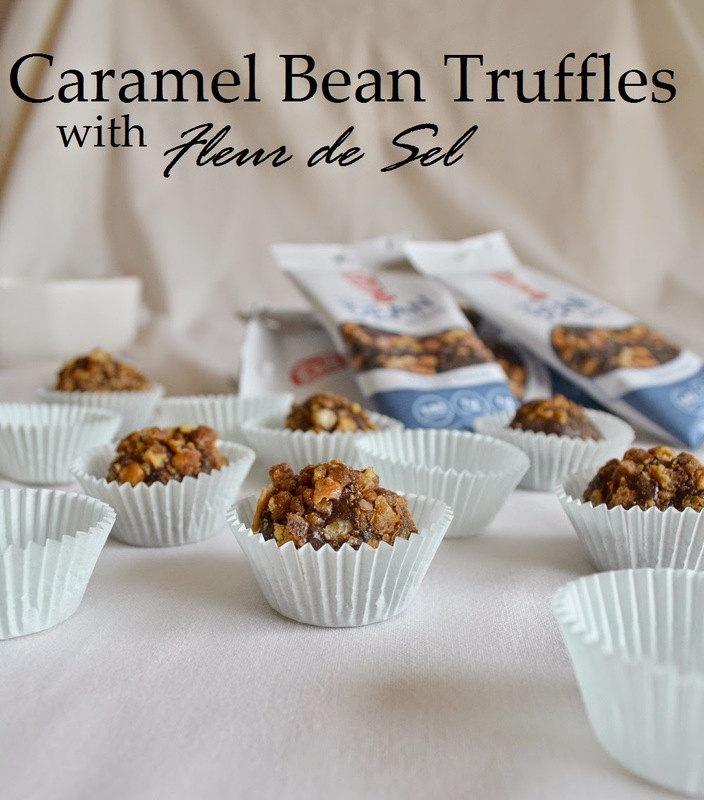 A nut-free caramel bean truffle was born - crunchy on the outside; rich and smooth on the inside. And now you know what a caramel bean is. Check out the recipe on SnackOutLoud.com and visit their facebook page to see what my competitors came up with. Then vote for your favourite! You can vote once a day and be entered to win a carton of your favorite Snack Out Loud flavor. Waiting for my box of truffle samples to arrive! Love it Rebecca!